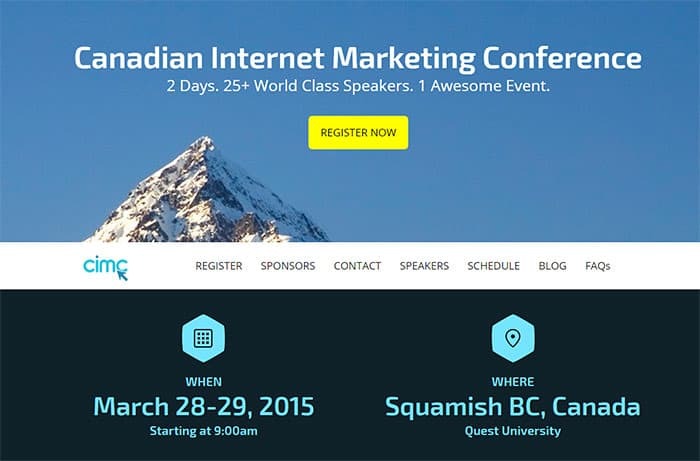 On March 28th-29th just a short hour and a bit drive away from Vancouver up in the beautiful mountain town of Squamish, BC the Canadian Internet Marketing Conference is happening! The conference promises to be full of inspirational and cutting edge talks on Internet Marketing given by over 25 world class speakers including high level marketers and thought leaders from companies such as Google, 1-800 Got Junk, Hootsuite, DDB Canada, and even our very own Michael Zipursky, Co-founder of FreshGigs.ca! Today we’re sitting down with Christian Thomson who is one of the Co-founders of this event to ask him a few questions about the Conference and of course what his favorite creative food and drinks are! Hey thank you for having me! As the owner of Marwick a Vancouver based Digital Marketing Agency I was searching around the internet looking for conferences I personally would want to go to and learn the very latest from the experts in their sector. I found conferences for marketing in general or specific to social media but nothing that took a broader look at modern day digital marketing. At least not without travelling to the US. We all want to learn from our peers, be inspired by the latest case study and generally hang out and network. So I started to connect with people I wanted to learn and be inspired from. The response was ace. I met with my friend Darian Kovacs who runs a digital PR firm in British Columbia called Jelly Marketing and said “hey I’ve got this idea, are you in” in true Darian style he said yes let’s do it. Darian and his team at Jelly Marketing have been amazing to work with. The conference has since grown into what many people are calling the go-to marketing event for 2015. We have over 25 speakers, panel experts and bloggers over the two day event. If you’re a business owner, work in a marketing department or within the industry (SEO/Marketing/PR consultant, web designer, blogger etc) then this event is for you. Speak about a couple of the key speakers you have lined up and what kinds of topics they’ll be diving into? Oh man, where do we start! We’re stoked to have Steve Tam from Indiegogo share his insights into building investment and an online following via crowd funding and we also have Fab Dolan, head of large advertising for Google, he’ll be sharing the latest tactics to drive more business online. But seriously there are so many awesome topics and speakers, you’ll have to head to the website for the full run down. What other kinds of events or activities will be taking place over the weekend besides the great talks? We have the Internet Marketing Awards and Best Agency to Work for Awards happening on the Saturday night. The CIMC weekend also has a $10,000 lion’s den giveaway for a charity to implement a digital marketing campaign, we have a helicopter tour for the top tweeter, a grumpy cat, parties, networking, good food, even better beer and so much more. 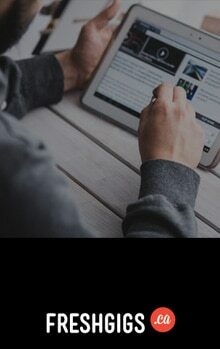 Can FreshGigs.ca community members and blog readers get a discount to sign up for this? Pretty please with a cherry on top?? If so tell us how? For sure but only if that cherry comes with a massive trifle underneath it. Head to www.DigitalBuzz.ca grab the early bird ticket (before Jan 31st) and then apply “fresh15” for an extra 15% off. Ticket includes admission for both days plus lunch, coffees and good times. So the conference sounds great, we’ll be there for sure! But let me ask you a question that I’m sure everyone wants to know – How do you connect with all these high level names and get them to talk at your conference? Give us a few of your personal tips for building a network of high level connections and getting influencers to agree to work with you? The biggest hook for most of them was when I told them I was going to introduce the event naked wrapped in bacon and drenched in Maple Syrup. Ok kidding, in all seriousness I believe it comes down to creating an event that works more like community. Darian and I wanted to create the Canadian Internet Marketing Conference as open platform for everyone. Last but not least Christian – if you were hungry and thirsty and really wanted and needed to get into your creative “zone” to get killer work done what would you choose to eat and drink and why? If it’s before 5pm then I’d say Eggs Bennie and a super coffee from Fergies Cafe if I’m powering into the evening then it would have to be some second cheapest wine (Youtube Video Here) and a good steak. Thanks for your time Christian and see you in March! I’m super lucky to have been invited as a business coach at this year’s conference! Of course I’ll be taking in the awesome speakers, meeting super inspiring entrepreneurs and joining Christian for an Eggs Benedict, a steak, or maybe both!